Surprised Stare put out an invitation for play test sessions each day at Essen for their 2008 planned release "Confucius". I signed up for the Saturday session. I would first say that this is a DEMO - indeed a PLAY TEST version and so is not the final version. So although I am going to end up saying I am looking forward to seeing the release version I won't give the game a rating yet as that is unfair. The players take the role of nobles in Confucian China and are competing to gain the most prestige with the Emperor. This is achieved mainly through gaining control of three ministries, fighting over seas wars or exploring brave new worlds (i.e. sailing off to explore). 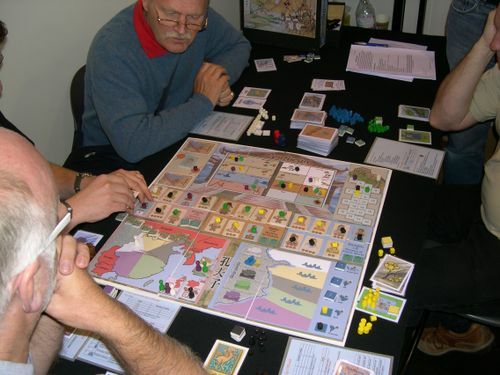 The players have a number of actions to spend in these activities each turn and they have a lot of choice over what they do. However an additional element is the giving and receiving of Gifts in true oriental style. Giving gifts obliges players to you and limits their choices especially against you. This is a demo -play test version and as yet is a prototype so most components cannot be judged. However the general looks of the artwork is fairly good, the board is clear and easy to understand once you have learned the game although i expect we might see a few tweaks before the release. The game will look to come with the game board, army pawns-action markers-bribe markers and gift counters per player along with a deck of money/ license cards, a deck of Emperor cards and a set of tiles for the officials, campaign tiles and prestige markers. There is also a Admiral ,general and Chief minister pawn. I will just describe the board game a little as it is necessary to understand that to play the game. The board is divided into 6 areas. Top left is an area for the Imperial Examination for officials. Next to that is an Actions indicator where you show what your actions you have chosen are. Then we have a prestige or victory point track. Across the middle third of the board we have the three Ministries –Army, Finance and Navy and each has 7 places for laying tiles representing officials into as well as two squares each to deal victory point tiles into. The lower third of the board is split into the Army box with home armies and foreign war zones ; and a Navy zone which shows harbours’ for each player a track of 4 ships spaces and the destination squares where victory point tiles are dealt. A word about the Confucius cards. There are two types. One are Emperors cards which are earned in the game and offer advantages and benefits in game. The others are the currency cards and each will have a number of coin symbols and a number of license symbols. Cards run from cars with 1 coin and 4 licenses on through to 4 coins and 1 licenses so that one balances the other. Campaign or war zone tiles have 2 to 4 squares for armies to be places each worth 1 or 2 victory points. SOME also carry a Emperor card symbol as well. Each tile will have a coin value at the bottom. Officials tiles will have a coin value at the bottom from 2 to about 8. 3 official tiles are dealt into each ministry at the start of the game. Three campaign tiles are dealt into the War map. Five prestige tiles are dealt out into the Sea map destination tiles and two into each ministry. A stack of candidates for the Imperial Examination is also placed on the board with the top one showing. You start the game with three cards (the currency ones) and three action cubes and a gift card. Some one is selected as chief minister. That person gets the chief minister pawn and has to place one of his action cubes into a pending box. Starting with the player to his left play begins. Each player in turn places one action cube into the Action box and takes that action. Play carries on rotating until every action cube is spent apart from the one in the pending box which is spent last but counts for 2 actions. 1. Bribe an Official. You pay the number of coins in cards that the official has on his tile and place your marker on its side to indicate it is unsecured but bribed. Once you have a single official in a ministry bribed you gain a bonus (cheaper armies, cheaper ships, more income basically) . 2. Secure and Official. You can pay again to make sure of the official. Until this occurs you can loose the official in theory. 3. Nominate a candidate for the Imperial Examination which means you propose that the top tile becomes your’s and you will move it to the relevant ministry (they are colour coded) and gain him secured as yours. 4. Force an Imperial Examination. The examination to decide who gains the new official only happens if two players have candidates. This action enables you to guarantee the exam occurs even with only 1 candidate. 6. Start a voyage- transfer boats from your harbor to sea. Once 5 have done this you gain the Prestige marker and an Emperor card. 7.Recruit an army – this costs licenses and is cheaper if you have an official in the Army ministry. You place a army pawn in your home territory. 8. Invade a Foreign land. This costs coin. You move an existing army to a campaign tile and elect which square to occupy. You do not yet gain the points or the Imperial Card. 9.Buy gifts. You can buy a gift for increasing amounts of coins. Gifts are pivotal to the game so see a bit later. 10. Give a Gift – give one you have bought to the players or to the Emperor. 11. Transfer Influence. You can pay to change the marker of one official to your marker. 12. Petition the Emperor. (sorry this bit I did not see happen but I think you can change the candidate to your own). 13.Get commercial income. You can hand in up to 4 coins worth of cards and get dealt back 4 +1 cards. 1 Extra card if you have a minister in the Finance Ministry. Can only do this once per turn. 14. Get tax income. Get 2 cards. This can be done as often as you like. 16. Gain the Emperors Favour. This is the box the First Minister placed a cube into. It is only used by him at the end of the action phase to count as a 2 action marker. What’s this about 2 actions. Well most actions take up 1 action marker. BUT some need two. These include the second or subsequent actions in the Recruit army/Invade Foreign lands box; the second or more action in the Buy ship and start a voyage box and the second or more bribe / secure official box. Now one thing that is done in an action phase is giving away Gifts. Gifts are important so lets talk a bit about them. You start the game with a low value gift. If you give a gift to another player they are obliged to you. They can’t replace your influence makers or bribe more officials than you have in a given ministry. Moreover the more gifts you give and receive the more action cubes you get (up to 5). Finally the most potent use of gifts is that the more expensive one have special abilities such as changing armies about, converting influence to you etc. Several important things now occur. A Great Wall chit is placed on the great wall to show that a round has finished. The great wall is used as a game progress marker. winner places an official in a Ministry. Now the thing here is you are obliged to vote for the candidate to who has given you the highest value gift. of these two gain Victory Points. Wars: A campaign may be complete if either all the boxes are full of boxes or a certain point on the great wall is reached. If the campaign is complete and all the boxes are full the campaign was a victory and every one who took place gains prestige. Whether it succeeds or fails one player will gain an Emperors favour card. One more official is dealt into each ministry. Each player discards down to 4 cards. The chief mister chooses another chief minster and the new turn begins. 1.The Great Wall is complete. So 9 game turns is the maximum game length. 3. The imperial candidate pack is exhausted (will only occur if players are vigorously nominating candidates. This is certainly a medium-heavy wieght game at first glance and there is a lot to understand and a lot of game mechanics influencing each other. So first time out will be a fairly steep learning curve. That said 15 mins into actually playing the game I had grasped the main game and could play the game without having to constantly ask the rules. The Theme is unusual and initially I was a little unsure if I really wanted to play a game about subtle gift giving in Confucian china. But you know after a while it really worked for me. In terms of type of game its action driven and a matter of making choices about what parts of the game to go after. Conflict is abstracted and so players who prefer to move armies and plan military strategy will not find this here. But building armies and sending them to war is one approach. Politics and bribery is the second and exploration and saling the third. In our game two of us focused on war, one on on the sea and two on the politics although we all had our fingers in at least one ministry. Of these three main strategies the exploration one was the least attractive it seemed as it took more effort to achieve and was a longer term strategy. But this ability to choose one strategy or mix it a bit appeals to me strongly. You must also adapt plans on the fly as others players actions block yours -as do their gifts. Player interaction is very high which actions directly limiting others players choices. Down time is low as you rotate actions each phase. Usually the turn reached me and I was only just about ready for it. Concerns - well very few. There is a risk of analysis paralysis here because there are so many choices players can sometimes freeze as they try and plan ahead. But this did not occur much in play for us. The theme might not excite some players but I would encourage them to give it a ago as the game play is good in my opinion. Overall I would say I really enjoyed the game. I will look forward to seeing it at UK Games Expo again or Essen. I would place it is the same level of complexity and game type as perhaps Puerto Rico although a different game and Confucius is not a trading game. BUt I means the game has a similar feel in terms of player choice affecting others choice. The designer who made "Tara - Seat of Kings" is going highly thematic into chinese "guanxi" and influence in chinese society? Much interaction? Different ways to win the game? This is a must buy for me. Thanks for this great (p)review !!! I am so excited by this game. i had been envisioning something simialr with more emphasis on the trading and sailing of the period. If you need playetsers I have a great group and would be happy to pay shipping, etc! Hurry up and get this great looking game produced. The effects of gift-giving are subtle yet far-reaching. In the game that Oskari pictured (that's my right forearm and nose), I had given him a gift very early on (the card with his yellow counters stacked on it) which cost me nothing but which actually prevented him winning the game on two occasions, as he was not able to hold more influence in the ministries as I did so long as he was obliged to me because of that gift. It's a cracking game. I can't wait to play the real thing next year. we should create a microbadge "Confucius-Fan" even before the release! Or something like that - do you players know of a single bit or typical pic for this? do you players know of a single bit or typical pic for this? Of course, I should have had something ready the day we posted Confucius on BGG as a game. I will put something together after work today. We at Surprised Stare have decided that the logo for the Confucius game will be the flower which is used to symbolise the gifts throughout the game. It appears on the board in the 'give a gift' and 'buy a gift' action boxes and also on the back of all the gift cards. We will be using it in our advertising and it will appear on the box and on our web site when such things are complete. I have therefore made the following Confucius microbadge and offered it for approval. Hopefully Lajos will approve it and it will be available to buy very soon. I have also uploaded a larger version of the image to the Confucius game section. If the mods approve it, that should be visible soon too. By 'eck, you're quick Charlie! I like it, especially, because it is absolutely different. A flower is silent and peaceful, and transmits a totally different appeal from the "fight" character most other games are so "proud of" - if you know what I mean. I take this microbadge as soon as possible! [Edit: Did some geekmod instead and some very blurry pictures helped me across the border.